An alcoholic family teaches children survival tactics. 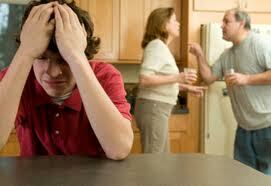 Alcoholic family members are embarrassed and develop strategies to cope. To the outside world, no one would know that they’re upset about it. They don’t talk about the alcoholic/addict outside of the family. They don’t trust other people, thinking no one would understand them and would gossip about them and they’re not open with their feelings. Others live in chaos, but will swear that this doesn’t affect them. This becomes a pattern of behavior. To become emotionally free, adult children of alcoholics (ACOA) have to release the anger that they have with their parent and accept that that’s the way life was. But, they’re not children today. They have to realize that they don’t have to carry childhood pain into their adult lives. This does not mean ‘forgive and forget’. It means that what’s past is past. What went on in their childhood was not good – however, to dwell on the past brings you back there. To be healthy and develop healthy relationships with others, you learn to accept, your past without anger so you can must move on. One of the problems that an ACOA, (or anyone else in a dysfunctional family has) is that they don’t know what a healthy relationship is. There is nothing to relate to and their expectations may be unrealistic. No family is ‘perfect’. But when you come from a dysfunctional family, you can’t compare. Everyone else seems better off than you. If you are a Child of an alcoholic/addict or have been brought up with family function here are some behaviors that you display. -	React and are hyper vigilant, just in case….. If you see these characteristics in yourself, you can get help. Al Anon meetings can be very helpful and so can Adult Children of Alcoholics (ACOA). Private counseling is specifically focused on alcoholic family issues. Coaching or recovery coaching is not therapy, but it's very effective in quickly dealing with issues. Similar to being on a team, the coach gives you the direction to get to your goals. Coaching may be exactly the answer that you're looking for. Many members of the clergy offer counseling services which are usually free of charge. But whatever you do, do something to give you peace of mind. Alcoholic family members can get support through NACOA Your childhood was affected by a dysfunctional family, but as an adult, you no longer have to carry the pain. Think you have an addictive personality? More on substance abuse and the family When you come from a dysfunctional family you can easily become codependent or enable others.